One of my favorite aspects of working in the food world is the ever-growing array of inspiring people you come across. Over the course of the ten years I've spent floating around this industry thus far, I've met characters ranging from award winning pie bakers, expert croissant makers, Italian olive oil producers, cheese affineurs, bbq wizards, spice merchants, and too many others to list here. While all of these people bear their own unique stories, there seems to be an underlying, unifying force among them all; a deep-seated love for good food and a desire to share one's passion and knowledge with others. Abby Olitzky & Steve Hall beautifully exemplify this philosophy. I first met Steve (and subsequently his fiancée and business partner, Abby) at the start of his tenure at Zingerman's Deli in Ann Arbor, MI over 3 years ago. 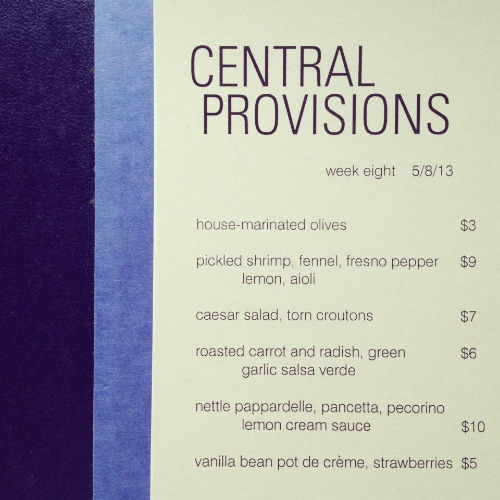 After only a few interactions at work, he invited me to check out his pop-up restaurant/working larder called Central Provisions. Without much context, but ever eager to expand my food horizons, I decided to take him up on the offer. It turned out to be a very wise decision. The meal to follow that evening surpassed any of my wildest expectations. Delicate and snappy pickled shrimp, so briny and refreshing they almost made me forget I was in Michigan. Vibrant roasted carrots and radishes that nearly screamed "fresh picked this morning!" Sinfully luxurious nettle pappardelle with pancetta, pecorino, and lemon cream sauce that seamlessly towed the line between rich, yet surprisingly light. And the grand finale: velvety vanilla bean pot de crème topped with the tiniest, sweetest Spring strawberries. All I could ask myself upon leaving the meal was a. Where did these two come from? and b. When was the next time I could return for another round? Fortunately, question b was answered the following week when I sat down to yet another impressive dinner and officially solidified Central Provisions pop-ups as part of my regular dining out routine. There are a whole myriad of reasons why Steve and Abby's food excited me so much back then and why it still excites me today: it's local and seasonal in the truest sense; it's simple and steeped in tradition; it's driven by technique and a desire to truly master one's craft; it's beautiful and sophisticated, yet simultaneously unpretentious and humble. But what appeals to me most is that their food is rooted in a place and a time, representing the best that Michigan has to offer within each season of the year. Many chefs overly subscribe to concepts like this when opening restaurants these days, to the point where words like "local", "sustainable", "organic", and "farm to table" seem to have lost all meaning entirely. Steve and Abby's food speaks for itself, no pretense or explanation needed. Just the best ingredients, prepared in the most respectful way possible. Lucky for me and the rest of the Ann Arbor community, Central Provisions continued to grow, adding new projects to their repertoire along the way. Everything ranging from homemade picnic baskets chocked full of hand selected cheeses, small batch jams, and too-delicious-to-be-good-for-you salads, classes on British cheeses, elegant sit-down dinners, and holiday gift boxes brimming with decadent handmade pastries and candies. Today, the duo's one-time pop-up concept has expanded into an intimate, sit down restaurant just weeks away from opening in downtown Ann Arbor. Due to another successful Maine restaurant sharing the same name, Steve and Abby decided to rethink their Central Provisions title in order to truly set themselves apart. They settled on then name Spencer, which is defined as an individual who dispenses provisions--a fitting homage to the name that started it all. Spencer will be a breakfast, lunch & dinner spot specializing in small plates, grab and go sandwiches/salads/pastries, as well as an extensive wine and cheese selection. More importantly though, Spencer will serve as a neighborhood spot where guests can come and feel like family. In order to bring Spencer to life, Steve and Abby need some help. This is where you come in, Mad on Food readers! With a slated opening day of October 21st, there are a few last minute details that still need to be squared away, primarily purchasing the last few pieces of kitchen equipment, POS system, and finishing touches for the space. The two launched a Kickstarter campaign to raise $30,000 for said purposes, and after only one week, they are over halfway towards their goal. But they still have nearly $15,000 to go. I've had the fortune of calling Steve and Abby friends for the past three years, and I cannot think of kinder, more deserving individuals. These are people who do honest, thoughtful work that makes a difference. People who dream big and turn those dreams into reality. Their work ethic, talent, and drive is hard to put into words but is more than evident from the food they put on the plate. Just check out their simple leek tart recipe below and you'll get the idea. If you believe in the power of good food and good people to make a difference, this is a project worth supporting. And if any of you happen to be in the Ann Arbor area come October 21, be sure to pay Spencer a visit. You're sure to have a meal to remember. A note from Abby: I love leeks. I like them all buttered up. What better way to feature their savoriness than in cream and flaky crust. I made this because I had nothing else in my fridge one evening as guests were about to arrive. Sometimes you end up with your favorite things that way--spur of the moment, natural, not too fussed. I could go on at length about pie dough, but let's save that. For this recipe, feel free to use your favorite flaky dough or puff pastry. Preheat oven to 350 degrees. Roll out pie dough to a 12" by 6" rectangle. Place rectangle on a parchment lined baking sheet. Lay leeks on rectangle, cut side facing upwards, and fold over edges to make a 1" border. Pour 2 tablespoons of cream over the leeks, sprinkle with the dill seeds, and liberally season with salt and pepper. Bake for 20 minutes, then pour over the other 2 tablespoons of cream. Bake until the cream has mostly evaporated and the crust begins to take on a deep golden color, another 15-20 minutes. When tart is baking, place the canola oil in a small pot and heat to 325 degrees (using a frying thermometer to check the temperature). Take your julienned leek tops and place in the oil. Fry until the faintest golden appears on edges, about 2 minutes. Remove and place on a paper towel and quickly season with salt. When tart has cooled slightly from oven, garnish with frizzled leeks.